Today, we have a special treat from Allison Gingras, of Reconciled to You who has graciously offered to guest post this week! As I type there are only 3 more days until Christmas – well, at least 3 preparation days til Christmas. I have grumbled more than once this month how the late date of Thanksgiving, has left me short on time to prepare. There is so much can be said about that one little sentence and the true meaning of Christmas. Here are just a few of the things that come immediately to mind. 1. Christmas comes the same day every year – if I want to be completely honest with myself I’ve had 364 days or so to prepare for this year’s festivities. If I really want to enjoy the Advent season maybe I should do my shopping and wrapping in August? 2. Why do I put so much weight on all the ‘traditional’ preparations of the holiday – particularly gift giving. Where have I lost sight of ‘it is the thought that counts”, how much thought as I flip through Amazon am I really giving these gifts? If I really want to enjoy gift giving, maybe I should start making my own gifts beginning in January? 3. Back to the question I started with – Where have I put Baby Jesus? 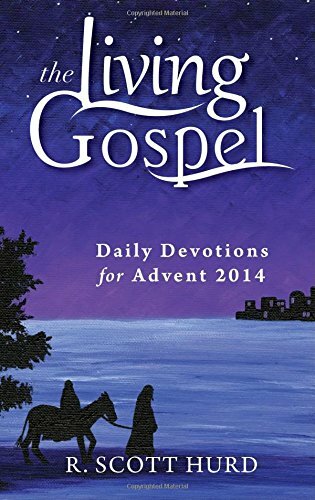 My Advent season has truly been blessed by the inspiration of the Holy Spirit to blog my daily reading of the wonderful book, the Living Gospel: Daily Devotions for Advent 2014 (Fr. R. Scott Hurd, Ave Maria Press). I do believe if it were not for this reflection time that I would have not done much by way of spiritual growing during this month. In addition to the gifts, cards and food preparation for the BIG DAY, I have been trying to prepare for the launch of my new radio show, A Seeking Heart with Allison Gingras on RealLifeRadio.com. A very unexpected, yet remarkable, blessing to come into my life just before Advent began. True confession, my number one goal for Advent was to attend daily Mass. I have felt this nudge for a long time to try to kick my night owl ways and get myself to the Eucharist every day – and not just in Adoration (though I am truly grateful to be at a Parish where Monday – Friday that is possible for me), but in reception. At the heart of this goal was to encounter Jesus every day – to come to Him in the Eucharist and be fed, nourished, encouraged. Instead, I continued to work into the wee hours shopping online, writing, or preparing in one way or the other – leaving my soul to it’s own devices for the BIG DAY. Which brings me to my fourth and final point for day’s reflection. The Big Day — during this time of the year I am speaking of Christmas, but when considering preparing to meet Jesus in the larger scheme of things – that day could be any of the days ahead. Whether I am ready or not, that day, like Christmas will inevitably come. I am either going to meet Him, through my death, or Him coming to meet us, through the Second Coming. Would I truly be ready – would Jesus be looking for me have the perfect gift nicely wrapped for Him?? Would He peruse my Christmas Letter before passing final judgment? I pray He won’t be seeking a snack – as I am probably one of the worse cooks in America. Previous postCarry Your Candle..Go Light the World!